RIYL: Strapping Fieldhands, Ariel Pink, Guided by Voices, Syd Barrett, Pearls Before Swine, Sebadoh. 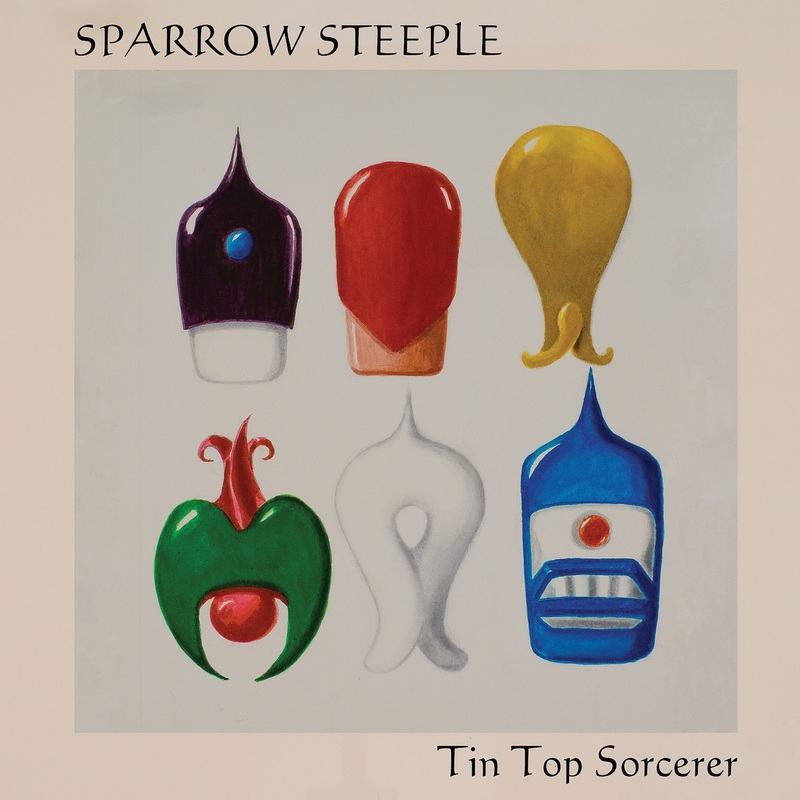 Sparrow Steeple’s music exists in its own universe. An imagined utopia (or is it a dystopia?) of wolfmen, murderous wizards, whispering woods & leprechaun treasure. Their second album “Tin Top Sorcerer” arrives near the front end of 2019, just in time for spring to blossom. Comprised of three members of inscrutable indie legends Strapping Fieldhands (who blazed many musical trails in the Nineties via records for Siltbreeze, Shangri-La & their own Omphalos Records), Sparrow Steeple specialize in mini-opuses that drift & careen haphazardly like Grimm’s Fairy Tales sung by Syd Barrett – psychedelic tales of rapturous joy & sinister machinations by creatures real & imagined, all wrapped around dreamlike tunes of avant folk, psychedelia, and outsider music. “Roll Baby”s drunken-tavern sing-a-long is peppered by blistering guitar leads & wobbly harmonica (courtesy of Philly-legend “Harmonica” Dan Balcer) while “Stabbing Wizards” backwards guitar lends a foggy aura of disquiet to the tale of treachery & betrayal. Despite the fantastic yarns spun (see the tragic tale of the “Wolfman of Mayberry”, or “Girl of the Whispering Woods”), “Tin Top Sorcerer” has an air of realism – or perhaps “magical realism”, that place these songs in a place simultaneously out-of-time and from a possible future, permeated by a sense that these things could actually have happened (or will happen) at some point in our shared existence.